ISO/IEC 20000 is the international standard for IT service management, and certification is a great way to show the world your expertise. Implementation and certification will not only improve your business processes and practices, it will reassure new and existing customers that your company is efficient, reliable and trustworthy. Customers will return because they know from experience that your service is second to none. Many customers look for suppliers with ISO/IEC 20000 certification, seeking the reassurance it provides. This book will guide you through implementation and certification. Your streamlined management processes will enable you to offer first-class customer service at competitive prices. The positive impact on your profit margins is just one of the benefits that certification can give you. 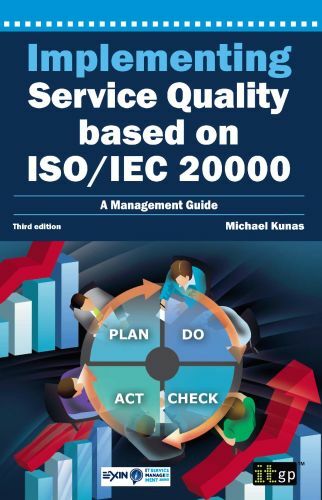 As well as a great source of practical advice and recommendations on how to prepare for audit and implementation, Implementing Service Quality based on ISO/IEC 20000is also the ideal companion to a number of training courses such as EXIN’s IT Service Management based on ISO/IEC 20000 programme and PEOPLECERT’s Professional Certification in ISO 20000. The Foundation level and Associate level of the EXIN programme are also completely aligned to the book. Buy this book and see the benefits of ISO/IEC 20000 certification. Michael Kunas is an ISO/IEC 20000 Lead Auditor and ITSM Consultant with over 20 years’ experience in all areas of computer science. He has many years’ experience as a worldwide consultant, lecturer and conference speaker on the topic of ISO/IEC 20000 and its related frameworks and methods. He has also co-authored a book on Mathcad Software and articles about IT service management, ITIL and ISO/IEC 20000 in Spanish computer newspapers, such as Data TI and Computerworld.